Typesetting the old fashion way! Typesetting the old fashion way!, originally uploaded by etec540’s photos. This is a blog posting from Jeff, one of your instructors. You’ve likely read some bio information about me in the course introduction already. I wanted to also post a blog entry here to get us all started with our class introductions. This early 19th century photograph of typesetters nicely depicts the close relationship between literacy and technology. 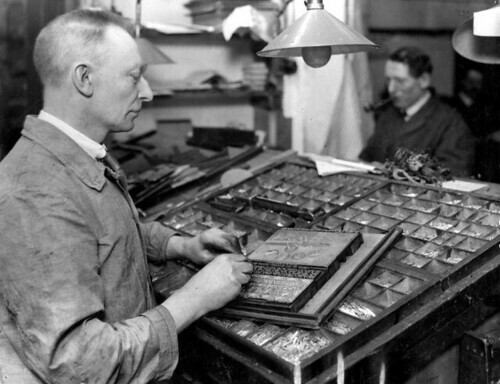 The two men sitting before rows of dirty lead type, have their hands covered in the industrial processes by which books or newspapers of the time were published. I now have in my kitchen a similar wood tray that was once used by typesetters such as these. It is an antique, an artifact from a different time when type had to be set by hand. It holds old corks and knick-knacks (and a lot of dust) and is a nice reminder of how dramatically can change the means by which we produce, reproduce and consume texts. An historical perspective is essential in fast changing times such as these, particularly when we are perpetually told that all of our media are new, that books are going the way of the dodo, and that all of children are now digital natives of a country that we can only hope to visit with a visa and an accent. This course will challenge us to think about historical periods in which different technologies have impacted the ways by which people communicated with one another through different media. Hopefully some of the artifacts we encounter, as well as the social and cultural responses to these media, will help us to better analyze the changes currently underway in a world swept with digital media, convergence technologies and networked communications. I look forward to exploring these issues with all of you in the course!